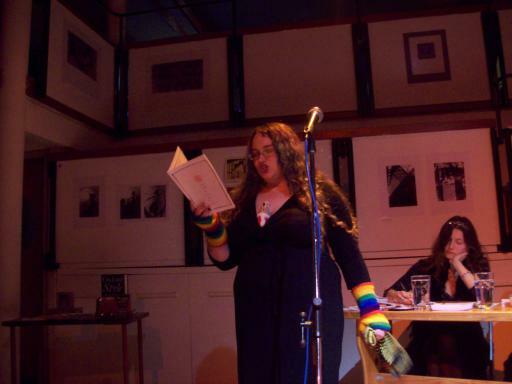 Last year I had a great time at the first Poetry Slam to be held in Cirencester. It was organised by the fab Marcus Moore and Sara-Jane Arbury and was lots of fun. Of course I did not score very high but that is not why I go to them – this was my third Slam and I think I have drastically improved from my first one. I performed Mummy’s Socks from The Little Book of Festive Poetry and even sold a copy! Which means I have enough money to another book for the school library! Here is a picture of me mid sock swing. I had a great time catching up with old friends plus it was my first time out in not completely flat shoes since Mary’s pregnancy. So it was win win and yes I had to use the walking stick to get back to the car but that was due a) it being cold, b) having stood around chatting to people and c) having parked far away from the venue as our sat nav doesn’t understand Cirencester! Once again I got to perform with Breda Reed Brown who is The Gloucestershire Poet Laureate, Joy-Amy, Cloe who I normally see telling stories rather than reading verse! and The Luchador Poet. Plus the lovely Tommie who I met at the qualifier for the Cheltenham Literature Festival Slam. This time I also had Alaric with me which was lovely as we got to have a meal together as well Just a shame he has a cold at the moment so wasn’t feeling to hot on the night! (hence no video!). However there is a video of me performing the poems at The Brewery in Cheltenham the year before! And you can go and listen to nice recordings of the poems and my christmas story at my Bandcamp. Lets hope this Christmas season is as awesome! Categories: Festival, Festivals and Events, Kids, Merchandise, Performance.